Is the T-bone in your T-bone making your steak extra tasty? For decades, the steak world has been caught in a porterhouse-sized argument. On one side we have legions of chefs, grill-masters, and steak traditionalists who insist steaks taste better with the bone left in. On the other side we have a vocal handful of steak aficionados who say it doesn’t make a lick of difference. Thankfully, after years of debate, the argument’s reaching its close. In recent years, food scientists and grill-fiends alike – including barbecue whisperer Craig “Meathead” Goldwyn, food-science scion J. Kenji-Lopez, and even the Meat Science team at Texas A&M’s Agricultural and Life Sciences Department – have set out to tackle this issue once and for all. Below we include the case for bone-in, the case for bone-out, and the truth behind whether that rib bone in your tomahawk rib-eye makes a difference to its flavor. Talk to the majority of chefs, grillers, and meat-lovers and they’ll all tell you the same thing: of course your steak tastes better with the bone. The reason for this, they claim, is that flavors within the bone gets transferred to the steak and soaks into the beef during cooking. All bones are full of a substance called marrow. In steaks, marrow comes in two forms: red marrow and yellow marrow. The yellow marrow in steak bones is positively delicious. Cowboys used to call this prairie butter, and it’s one of the most underused, underappreciated ingredients out there. Bone-in advocates say that when you cook your steak, this yellow marrow seeps through the bone and into your meat, giving it a smoother, more buttery flavor. Those arguing against bone-in aren’t saying you should always cook your steak boneless, they’re saying it doesn’t make a difference either way. These grillers point out that cow bones are near-impermeable, meaning that there’s almost no way for marrow to get through the wall of the bone and into your steak. They’ll also point out that a layer of collagen lays between the bone and meat, sealing off anything that does manage to seep through the bone. As such, there’s no way for rich, delicious marrow to soak into your meat. So Which Is It? Bone-In, Or Bone-Out? Looking for answers, both the Meat Science team at Texas A&M and Serious Eats’ J. Kenji-Lopez recently decided to put bone-in vs. boneless steaks to the test. The results? Flavor-wise, steaks cooked bone-in are indistinguishable from boneless steaks. The main effect of cooking with the bone-in on your steak is insulation. Bones take longer to heat up and longer to cool down than beef. As a result, meat right next to the bone can come off the grill 5°to 10° cooler than the rest of your steak. This probably accounts for where the flavor transfer theory came from. For grillers who cook their steaks to medium doneness or hotter, the section next to the bone ends up more juicy and tender. But this isn’t the case for everyone. For those who cook their steaks rare or medium-rare, this section is usually a little more chewy and raw, and of lesser quality. Whether or not this section tastes better is then a matter of how you cook your steak and what level of doneness you prefer. There are a few other minor differences. On the one hand, the researchers at Texas A&M found that bone-in steaks keep their shape better – though only slightly. On the other hand, keeping the bone on your steak often means you lose a full side of crisp, crunchy char and browning, one of the tastiest, most prized features of a great steak. As with most things in life, bone-in steaks are a case of pros vs. cons. In the end, it comes down to personal preference. 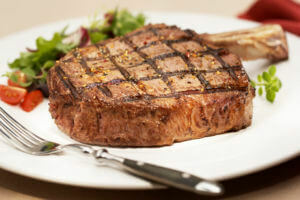 Some grillers love the look of a bone-in rib-eye, or the experience of gnawing the last scraps off a premium T-bone. Others would rather get a fully-seared steak that’s cooked evenly all the way through. Remember: when you grill, it’s up to you. Now that you’re an expert in bone-in vs. bone-out, it’s time to learn the finer points of cooking great steak from the best. 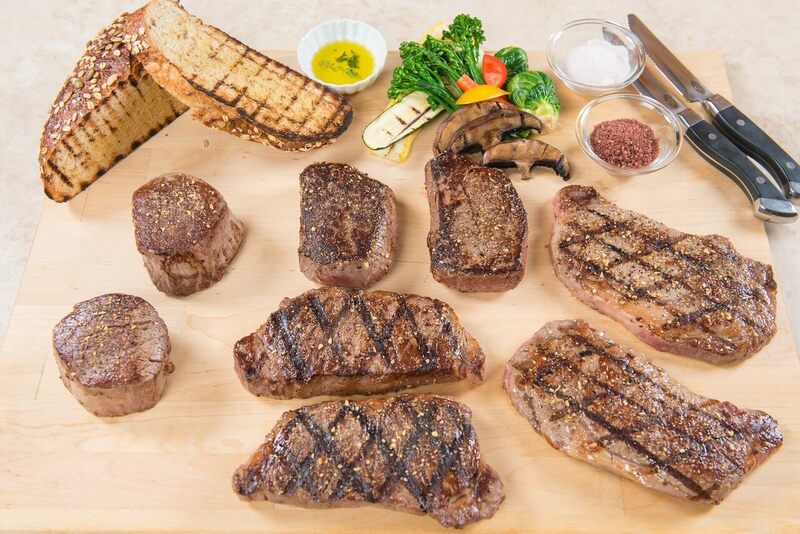 Check out Steak U’s TV episodes for step-by-step recipes and instructions from some of Chicago’s top chefs, and be sure to browse out our bone-in and boneless steaks which are perfectly aged for 6 weeks. For decades, the steak world has been caught in a porterhouse-sized debate. Is that bone in your steak making a difference in its tastiness? In recent years, food scientists and grill-fiends alike have set out to tackle this issue once and for all. The majority of chefs, grillers, and meat-lovers will tell you: of course your steak tastes better with the bone. 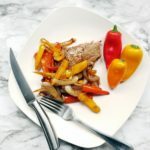 They claim that flavors within the bone transfers to the steak and soaks into the beef when cooking. Bones are full of a substance called marrow. In steaks, marrow comes in two forms: red marrow and yellow marrow. The yellow marrow is considered to be one of the most underrated ingredients out there. 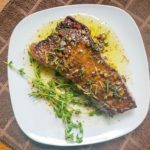 Bone-in advocates say that when you cook your steak, this yellow marrow seeps through the bone and into your meat, giving it a more smooth and buttery flavor. Those arguing against bone-in aren’t saying you should always cook your steak boneless. They’re saying it doesn’t make a difference either way. These grillers point out that cow bones are near-impermeable and that a layer of collagen lays between the bone and meat meaning that there’s almost no way for marrow to get through the wall of the bone and into your steak. In the end, it comes down to personal preference. Flavor-wise, steaks cooked bone-in are indistinguishable from boneless steaks. It turns out bones just don’t have a porous enough surface to let marrow juices through. That said, there are small differences a bone-in steak can make such as being slightly better at maintaining shape while cooking and providing insulation to the meat right next to the bone (a medium steak will be cooler right next to the bone resulting in a juicier steak! ).